This marks the first in a series highlighting students and teachers from NCMS. We started with Darcy as she has been a guinea pig for the school for many years and the director has easy access to her! Please email us if you have an NCMS student or teacher that you would like to nominate for a spotlight article. What classes or lessons have you taken here at NCMS? I started Harmony Road with Miss Marie at age 3. Later I graduated to private piano lessons. I have also done the World Cultures and Harmony Road camps with Miss Marie and Miss Debby. The past two summers I have done the Music, Art and Theater Camp with Miss Joy. This summer I had a few lessons on guitar and saxophone. Plus, Miss Lindsay helped me prepare for my Les Mis audition. What sort of activities do you participate in outside of NCMS? I like soccer with coach Howie, First Lego League and playing oboe in school band. The thing I REALLY love right now is doing plays. I did To Kill a Mockingbird (with Hollis Brookline HS) and Seussical (with Actorsingers) last year. Right now I am in Les Miserables with Actorsingers. It's a really big deal to me because it's a play that so many people love. I have to sing Castle in a Cloud by myself but I really love singing in the finale. It's so great to be onstage with everyone. It's incredible to be surrounded by all the amazing voices from the cast! What is it like studying with the professional faculty at NCMS? They are friendly. I know that they are professionals but I tend to just think of them as nice -and they understand kids. After I got the part in Les Mis I needed some extra help. I'm not old enough to take regular voice lessons yet but Lindsay gave me two lessons. One before the audition and another one once I got the part. In my lesson after I got the part Lindsay helped me think about how to express my song to the audience. 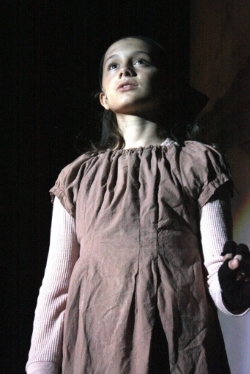 The character, Young Cosette, is in a bad situation. I didn't want to focus on that so Lindsay helped me find ways to do so as a normal kid. What is your favorite musician or composer to listen to? Imagine Dragons, Mumford and Sons and Fun. What is your favorite music to play or sing? It really changes. Right now I like singing songs from Les Miserables. They're crazy addictive. I kind of can't help it!